Rev. 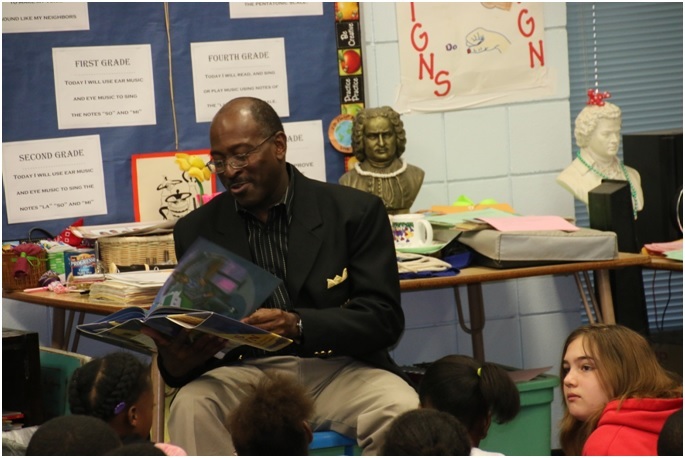 Ernest Lane, a member of 100 BMOT reads the book, “The Blues of Flats Brown,” written by Walter Dean Myers, to a music class at Sealey during the African American Read-In. Members of the Tallahassee Area Chapter of 100 Black Men of America, Inc., (100 BMOT) including Superintendent of Leon County Schools Jackie Pons and his Deputy, Marvin Henderson, helped students at Sealey Elementary celebrate literacy with more than a million readers all over the world, during the 26th Annual African American Read-In. The men read books written and or illustrated by African-American authors including Walter Dean Myers, Patricia McKissack, Eloise Greenfield, Donald Crews, John Steptoe, Jerry Pinkney, Faith Ringgold, Irene Smalls, Andrea Pinkney, Nikki Grimes and Angela Johnson. Charles Gatlin, Rev. 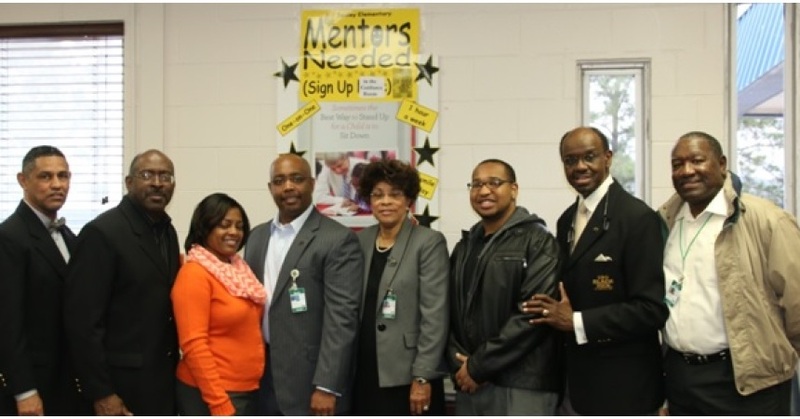 Robert Butler, Superintendent Jackie Pons, Chief Walter McNeil, Ray Mobley, and Gerald Williams, all members of Tallahassee Area Chapter of 100 Black Men of America, Inc., pause for a picture after participating in the African American Read-In at Sealey. Col. Ronald M. Joe, President of 100 BMOT remarked that, “There is a strong correlation between reading and the academic success of every boy and girl. It is an honor to participate in this Read-In to enhance the children’s appreciation for African American authors.” The African American Read-In is sponsored nationally by the Black Caucus of the National Council of Teachers of English (NCTE) and the NCTE. 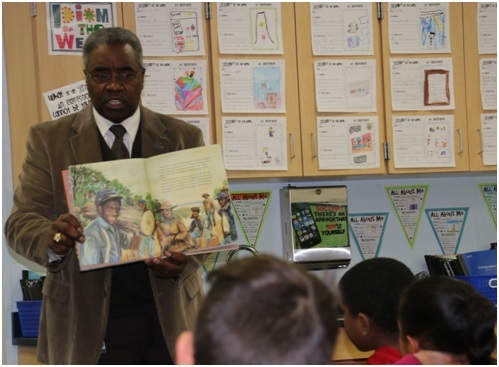 Deputy Superintendent of Schools Marvin Henderson shares a book about African-American soldiers in the Civil War. 100 Black Men members reading to the boys and girls, in addition to Pons, Henderson and Joe, were: Juan Collins, Gerald Williams, Selvin Cobb, Ray Mobley, Walter McNeil, Representative Alan Williams, Eric Friall, Rev. Robert Butler, Charles Gatlin, Rev. Ernest J. Lane and president of the Collegiate 100, Florida A&M University student, Thomas Range. Sealey principal Demetria Clemons thanked each of the readers and presented them with a certificate of appreciation. Visit 100 BMOT, a 501(c) (3) organization, at their website, www.bmot.com for more information about the mission and activities of the chapter. What Can Teachers do to Embrace Cultural Diversity?